Emeli Sandé visited Frida’s “Blue House” in Mexico City, which is now a museum in honour of the artist. Michael went there on a reading tour of Mexico, during which he got serious sunstroke, ate an iguana tamale, and came home with suspected hepatitis (he didn’t travel well!). As a young woman Frida Kahlo was in a terrible bus accident which left her in severe pain for most of her life, unable to bear children, and probably contributed to her early death at 47. She began painting to pass the time while confined to bed – a wooden four-poster which is still in the house, and features in one of her best-known paintings. I have a particular connection with this painting: when I was sitting beside Michael’s bed in the National Neurological Hospital where he lay unconscious after a catastrophic brain haemorrhage, I brought along a book of Frida’s paintings. I don’t know why I chose it, but somehow I must have had the feeling that looking at these images of suffering might be illuminating, or at any rate pass the time without needing concentration – at this point we were still hoping he might wake up. 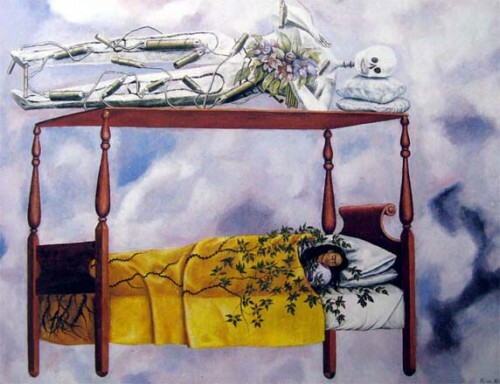 This bed, floating in the air between life and death, a skeleton on the canopy, seemed to sum up our experience, as well as reminding me of the Mexican view of death, that it is always present. 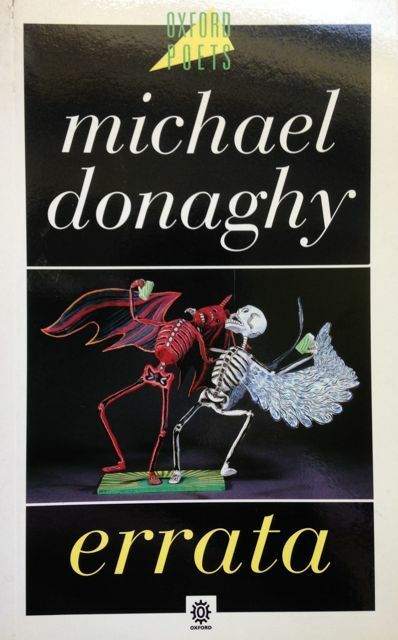 A Mexican Day of the Dead sculpture was the cover picture on Michael’s second book of poems Errata (published by OUP in 1994, and later incorporated into Dances Learned Last Night under Picador). Standing beside Frida’s bed in the Blue House, Emeli commented that she felt that an artist left most of their spirit in the place where they were creative. With a jolt, I realised that the sofa on which I was sitting was exactly in the position where Michael’s desk used to be when this room was his study. After his death, I left it pretty much as it was, full of his books and things, for several years, but eventually I realised that we needed to rebuild our home from the crater around which we were encamped, and turned it into a living room, storing his belongings, including seventy-five boxes of books, up in the loft. (These books will soon form part of the library at the newly refurbished Arvon Centre in Shropshire, The Hurst). A shiver ran through me at the thought that I was sitting exactly where Michael used to write his poetry. Although I can’t claim to be infused with his spirit, I do sometimes sit on this sofa to write; although I wrote much of my book in bed, like Frida, while I was ill with M.E. Maybe I’ll do it a bit more often from now on. Tags: Arvon, Dances Learned Last Night, Emeli Sandé, Errata, Frida Kahlo, Hurst, M.E., Mexico, Michael Donaghy, poetry, The Bed, The Dream | Permalink.